The Endangered Species portfolio was commissioned by Ronald and Frayda Feldman, longtime political and environmental activists. 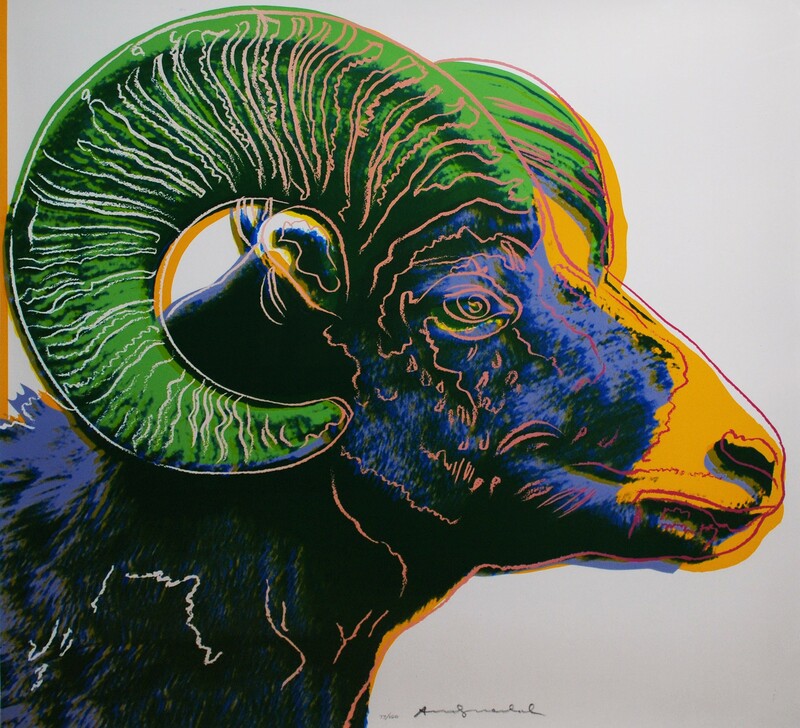 Warhol had always had an interest in animals and after a conversation with the couple about pressing ecological issues the idea arose to create this series. Using brilliant almost psychedelic colors and poignant expressions (suggestive of the animals fates) Warhol created a stunning display that is still relevant today. The portfolio was made in 1983 and consists of 10 different screenprints. Some of the animals he chose to highlight are: the African elephant, Siberian tiger, bald eagle, black rhinoceros, and the bighorn ram. He created a small main edition of only 150 of each image, making the existing pieces quite rare. He also created 30 individually unique Trial Proofs of each image, to test and choose the colors scheme for the main edition. These “TP’s” are exceedingly rare, they are unique pieces. 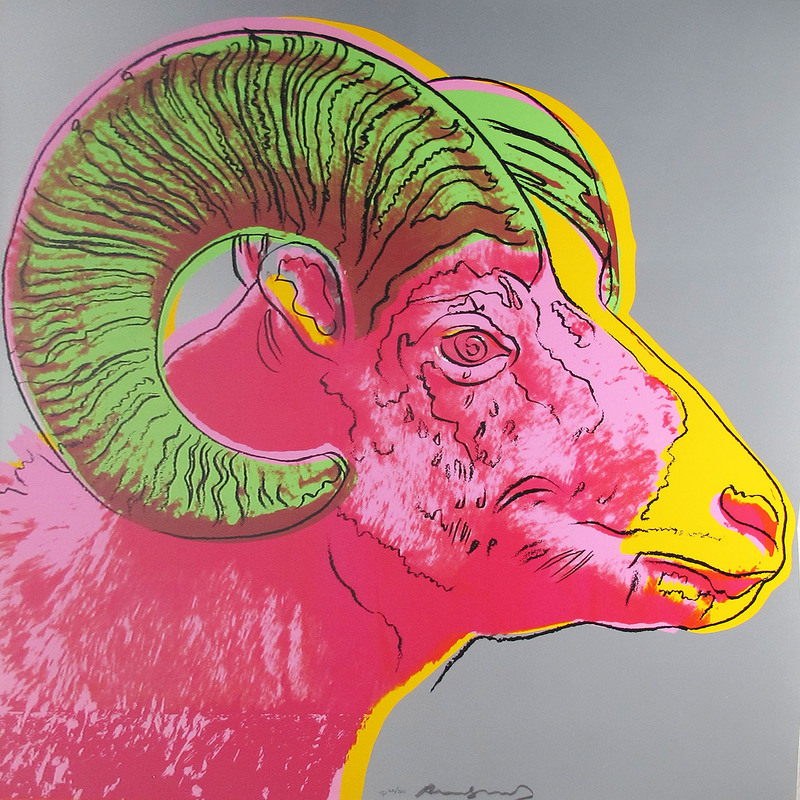 We are very pleased to have one of the 30 Trial Proofs of the “Bighorn Ram” available here at Valley Fine Art. On the left you see the color scheme of the Bighorn Ram if the main edition of 150 and on the right the unique TP color scheme of the piece. One will notice that they vary quite vastly in color which gives an interesting view into Warhol’s process. For every collection that he created he made a number of trial proofs, which were never specifically intended to be sold. It is a great opportunity for the collector to come across a piece of this exceptional quality and rarity.